Mineral and bone disease is omnipresent in patients with chronic kidney disease (CKD) and leads to a diverse range of clinical manifestations, including bone pain and fractures. The accumulation of traditional clinical risk factors, in addition to those related to CKD, enhances the risk of comorbidity and mortality. Despite significant advances in understanding bone disease in CKD, most clinical and biochemical targets used in clinical practice remain controversial, resulting in an undermanagement of bone fragility. Vitamin D supplementation is widely used, but only a few studies have shown beneficial effects and a reduced risk of fracture and mortality. The achievement of serum levels of 25-hydroxyvitamin D is recommended for CKD patients to reduce a high parathyroid hormone level, which is associated with skeletal fractures. Optimal control of parathyroid hormone also improves bone mineralization and lowers circulating bone biomarkers such as alkaline phosphatase and cross-linked collagen type I peptide. The potential value of more recent biomarkers such as sclerostin and fibroblast growth factor 23, as surrogates for bone fragility, is an encouraging new direction in clinical research but is far from being firmly established. This article reviews the literature related to the pathophysiological role of various mineral and biochemical factors involved in renal osteodystrophy. 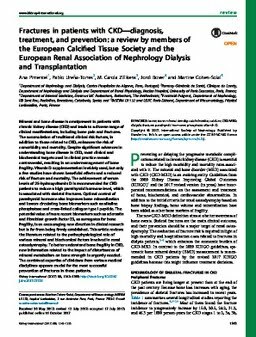 To better understand bone fragility in CKD, new information related to the impact of disturbances of mineral metabolism on bone strength is urgently needed. The combined expertise of clinicians from various medical disciplines appears crucial for the most successful prevention of fractures in these patients.